Target players to stay in their areas. 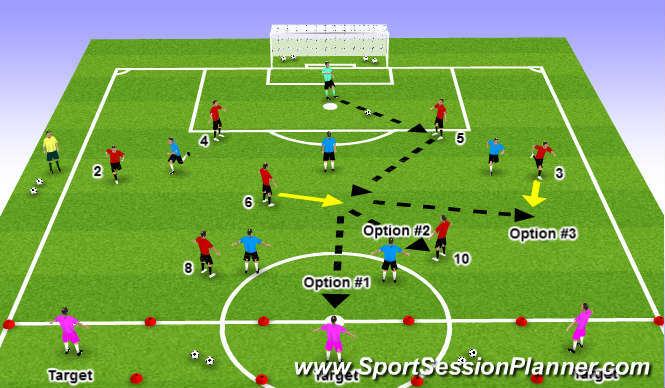 Any starting point where the GK can win possession. (a shot on goal under pressure, wall pass played to far into the GK&apos;s hands, poor penetrating pass). A situation where the defenders are getting compact and marking tight and not spreading out. A realistic game situation, created from your last game where the team was defending and the GK won possession and your team could/should have played out of the back. Coaching Points: vs. 4-3-3 oppoent. Playing against one central striker allows for the Centre Backs to open up wide (within the passing range of the players ability & age) and push the Fullbacks forward to encourage the opponent&apos;s wingers to follow. If they do, the CB&apos;s can receive possession with more space available. 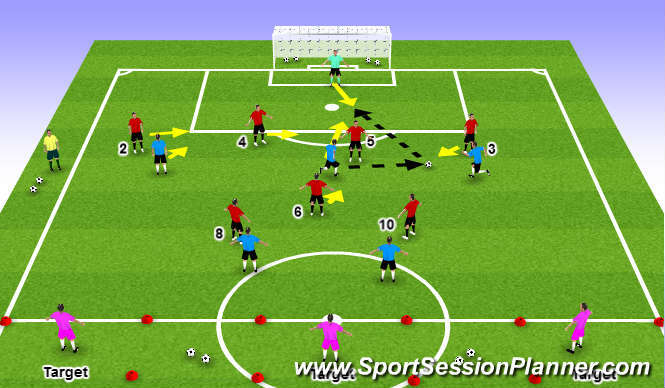 If the wingers do not follow, then the ball can be distributed via throw or kick from the GK to the FB. It is important to have the Attacking MDF players push forward onto the edges of the centre circle to create more space for the HMDF who can support the CB or even receive the ball directly from the GK. Arrive into good supporting positions where it forces defenders to make decisions and play unpredictable (between, behind or around opponents). Receive the ball at their feet where it can&apos;t be intercepted. Play passes (early, quickly & accurately) forward to Target players when not undr pressure and support the play to score. Encourages fast attacking transition play. Against a 4-4-2 opposition, the CB&apos;s would tuck inside tighter and FB&apos;s to play flatter to encourage wide MDF players to come forward to pressure. Same could be said about playing against a 5-4-1 or 4-2-3-1.